As a certified dog trainer, I want to help you choose the best options for your dog. I don't believe that you need a lot of equipment for obedience training. So I'm going to walk you through the different tools available, and show you what is worth investing in, as well as what is a waste of money! If you've ever been to an agility class or an all-positive training school, you will know what a clicker is. A small plastic button that produces a click when pressed, it's used to mark the correct behaviour of your dog at the exact moment that it happens. The click is followed up by giving your dog a treat, and thereby causing him to associate the clicking sound with a reward. Eventually, a dog is weaned off the treats (or at least the large amount that is used at the beginning) and the dog learns that the click means a treat is coming... eventually! While I don't find that clickers are the best dog training tool to use for obedience training (sit, stay, come, heeling, etc. 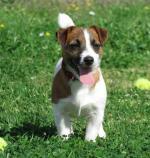 ), they have their place in agility and other dog sports. A clicker can be really useful in teaching your pooch tricks, as well. You can simply say "Yes" and then follow it with a treat, as many handlers and trainers do. This is sometimes easier for you to do when just starting out with dog training... juggling a clicker, treats, a leash, and using hand signals is a lot of coordination! That in itself is an important reason to consider whether using a clicker for obedience training is really the best choice. I personally don't use clickers, except for agility training. And as obedience training is often done with your dog in close proximity to you, I prefer to be more hands-on with praising my dog. Often used in herding and hunting, a dog training whistle is perfect for working at a distance or out of sight of your dog. You can train your dog to respond to different whistles for commands such as come and stay. As a dog's hearing is better than their sight, it's a great tool for training. Remember - a whistle in and of itself won't guarantee a good recall! It's the training and practice that you put into it that will. There is a lot of mixed opinions on collars. The fact is, your dog needs one. Trying to train a dog without a training collar is a lot like trying to drive a car without power steering. These dog training tools are completely worth the investment! Soft - a soft tempered dog is one that is considered "meek" or very submissive. He never tries to assert dominance over a human or even another dog. This dog is very easy-going, and generally will listen to a verbal reprimand. I would also lump puppies under 3 months of age in here, as well as dogs who have been abused in some way. Medium - maybe your dog is right in the middle... not exactly a soft dog, but you wouldn't consider him hard either. He fits in then as a medium-tempered dog. Hard - this dog has more of an "attitude". A firm correction sometimes will hardly fizz on him, and you would probably call him stubborn. A hard dog can also just be one that is high energy, and is always go, go, go. 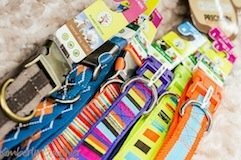 Each category of dog is best suited to a difference type collar. Read about each dog training collar in lots of detail, as well as other training devices that are used. These include head halters and no-pull harnesses (which I don't recommend!). What in the world does a crate have to do with training a dog? Everything! I consider a crate one of the most important dog training tools you can invest in. From the moment a dog joins my family, the crate is an integral part of life. My dog loves her crate, and she sleeps in it at night and anytime we have to leave the house. Used in the right way (never as punishment), a crate can solve a lot of problems in the house - from chewing to peeing inside. And dogs love them... they are "den" creatures, so a cozy crate is the perfect safe place. A crate is the safest place for your dog to travel in, too. Not to mention that any overnight veterinary visits will go smoother if your dog is used to being in a crate. Crate training a dog is best done very incrementally, and should never be rushed! Another way you can use one is by teaching him a "place" command. When you have people come to the door, or you want to eat dinner without your dog begging, simply send him to his place. Where I live (in Canada), dogs must be leashed whenever out in public. This means that it's absolutely essential to have your dog leash trained. And no, not all leashes are created equal! Flexi-leash - don't waste your money on a retractable leash! You can't train a dog on a flexi-leash, and they have a tendency to snap as the rope is very thin. Leather or nylon - This is the type of leash to get for training. 6 feet is a good length to start with. Chain leash - Again, not a good choice. This type of leash is way too heavy and bulky, and you can't use it for training purposes very well. Long line or lunge line - Another great investment! I recommend anyone training a dog to get one of these. I use a 50 foot long line regularly for working on my dog's long distance recall, as well as for sit-stays and down-stays at a distance. And this is THE tool to use when you teach your dog to fetch! E-collars and other electronic training equipment is often over-looked or branded as being inhumane. Granted, in the wrong hands and without proper instruction, these dog training tools can harm a dog. That being said, so can a flat-buckle collar or Halti. These dog training tools have gotten a bad rap from many all-positive trainers... those who train using rewards only, and never give a correction for bad behaviour. But a dog's world is very black and white, and a dog learns best when he is shown exactly what is and is not good behaviour. A dog who jumps is not going to stop jumping unless he is corrected for jumping and praised for keeping all four paws on the floor. One of the first things that comes to mind when thinking about dog training tools is probably treats. Treats can be really handy for training, but I find that most people over-use this dog training tool. Especially in the all-positive training circles, training is near impossible without them! While I believe that there's nothing wrong with treats, I don't want my dog to become reliant on having a treat in front of her nose to listen. I use the balanced training method, and focus more on verbal and physical praise (or toys) than treats. If I had to give a percentage, I'd say that my dog gets a treat about 5% of the time. But you'd better believe that the treats she does get are the best dog training treats out there! So no, treats are per se a necessary part of training, but I recommend using a small amount to help create motivation in training. Remember, you don't need a ton... just a few treats in your pocket for training is definitely enough. Dogs live for the moment, so reward and correction must be for the moment, too! In dog training, reward is just as important as correction. I believe that the best rewards are varied and interesting to a dog. What do I mean? Well, your dog's ordinary bone or chew toy isn't the most interesting thing your dog has seen. But if you have a special toy that only comes out for training, your dog will be so interested in this new toy that he'll do anything for it! The key is to keep it special. When you're not training, keep it in a drawer out of sight, and make sure that you don't let your dog play with it at any other time. While training, keep the toy in your back pocket, or somewhere on you where your dog can't see it until you pull it out to reward him. A tug toy can work well as a reward... just be sure that you remain in control and teach him a solid "drop it" command. Play a quick, short game of tug, make him release the toy back to you, and then put it in your pocket again. This will leave your dog wanting more! Why would you use a toy? Well, not all dogs are food motivated. My own dog will do anything for food, and won't even look at a toy. But some dogs are the opposite. In this case, using a toy as a dog training tool to reward is the perfect solution. If Rover's not that interested in tug, that's okay. Find a dog chew toy or ball that he goes crazy for (or even a stick! ), and use that instead. In this case, you would allow him to chew the toy for about 30 seconds and then put it away. Just a note on timing: In order for your reward to be effective, it has to appear within 1.5 seconds of the good behavior! 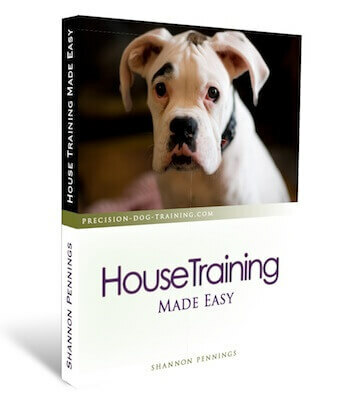 So there you have it - all the dog training tools you may ever need. Armed with this information and what I recommend, you can now make the best choices for your own dog!